Fermentation Friday is the new homebrewer blogging community blogging day, the last Friday of each month. That’s today. Today’s topic is roughly “what’s the craziest brew day thing you ever did?” It’s hosted by CNYBrew. For a while I was into making beer without hops and with other herbs instead. Not that I made a lot of beers this way, but I thought a lot about it. It’s a really cool idea that could pan out once I get up the guts to do it more often. It’s hard to risk a batch of beer on an outlandish experiment. Especially when your first foray into the concept goes awry. Many brewing processes and techniques have funny or fun names. 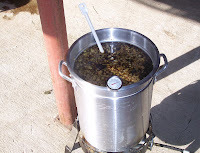 One particular time-honored brewing tradition is called partigyle (or parti-gyle) brewing. This is the practice of making two separate batches of beer from a single mash. Generally a big beer is made from the first runnings of the mash, and a small beer is made from the sparge runnings of the mash.